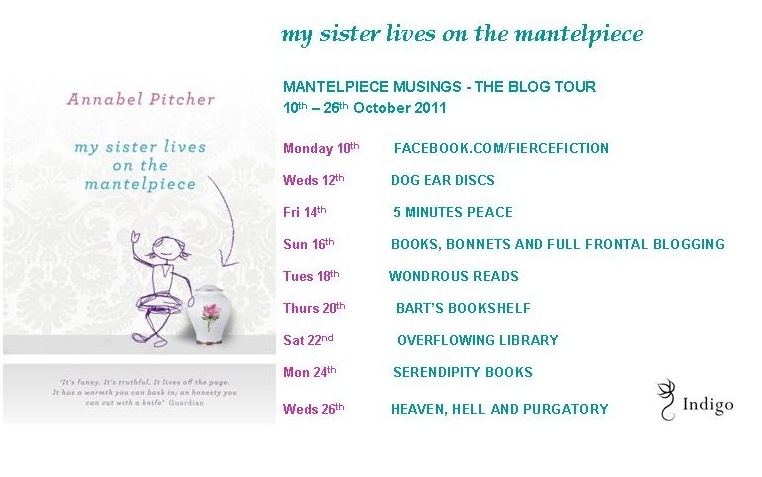 As part of the Mantelpiece Musings blog tour which celebrates the paperback publication of My Sister Lives On the Mantelpiece, the delightful debut author Annabel Pitcher, stops by to give us a peek at a day in her life. In September 2010, my life changed dramatically, going from the very structured environment of a school to the freedom of working from home as a writer. Well, I say freedom... I was so used to the regimented school day that at first I found it impossible to get out of the habit of thinking in those terms. I had a break at break time, my lunch at lunch time, and found it impossible to do anything after 4pm when the school day finishes. After a month or so, I realised that this was an ineffective way to work. I write far better in the early hours of the morning than after lunch. And by early hours, I mean early: after much experimentation over the past year, I have discovered that I am at my most creative between the hours of 5am and 10am. For some ungodly reason, my brain is far more active, words flow far easier, and I can make decisions about plot or character far more quickly and efficiently. It was therefore a bit futile to start work at 9am and work ‘til 4pm as I was wasting four hours of my most productive time of day. This means, then, that I often get up when the world’s in darkness, stumbling about in my dressing gown and stubbing my toe as I switch on the light and make my first cup of tea of the day. Thankfully, my husband is an early riser too so we’re always out of bed by 5.30am and I am normally at my desk by 6am in my skinny jeans, purple boot slippers and one of my giant jumpers – my writing outfit of choice. I have converted one of our bedrooms into an office, and I only ever go in there to write to try and create the sense that I’m going to work, rather than just staying at home. I couldn’t possibly write in the lounge or in bed (though I have to admit I am typing this hidden under the duvet because it is a particularly cold, wet morning!). I love my office. It has a big desk and bookshelf and it overlooks the fields at the back of the house. It’s east-facing as well, which means I often see the sun rise as I’m writing. No matter how difficult it is to get up so early – and yes, I do moan and groan and rub my eyes with my hair sticking up all over the place – I am always so pleased to be at my desk when the sun peeps over the fields, turning the whole world golden. 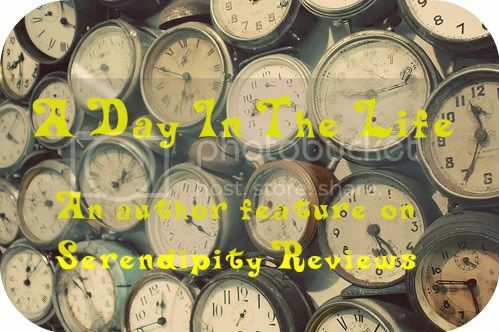 There is a gorgeous sense of newness and excitement and potential at that time of day, and I love the feeling of writing a few hundred words before the rest of the world has woken up. I work hard all morning in two hour bursts, taking fifteen minutes out for a cup of tea at regular intervals, and I have normally completed all the productive writing that I’m going to do by lunch time. After a half an hour lunch break, it’s time for emails or editing. I edit as I write, perfecting each section before moving onto the next, and I find it takes less concentration than producing the words in the first place, so it’s no problem to focus on this after lunch. After a couple more hours, I am usually itching to get out of the house, so I go for a walk or run or to the gym (or sometimes just slob about in a cafe with a book, a coffee and a big piece of cake!). Thank you Annabel for letting us intrude into your writing day. If you would like to follow the blog tour or read some of the previous posts from Annabel, then please check out the posts and blogs below. 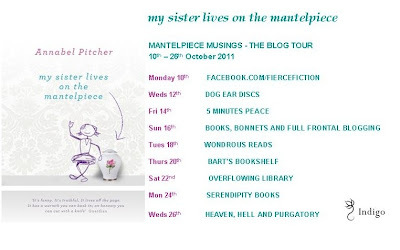 More information about Annabel Pitcher. I love the sound of your writing room - how amazing to sit and watch the sunrise every day. Carmen - I have this urge to write before dawn now. Not sure if my body will comply though. Excellent feature! This writer knows what works for her in terms of writing. I (usually) feel the same way in the morning, that the day is filled with newness and possibility. Wow, that sounds like a dream office - but getting up at 5:30 (I feel like the walking dead when I have to get up at 6:30), it's making me feel tired thinking about it :) Great post!